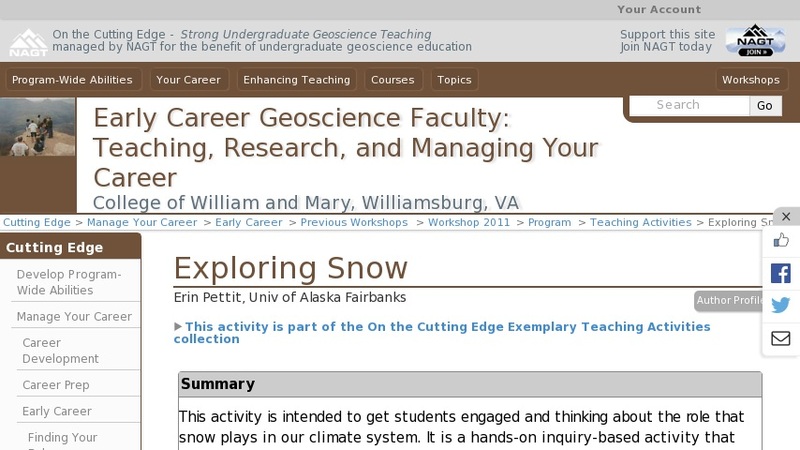 The students will come into this activity with no or very little knowledge of snow. They will divide into groups, each group receiving the first list of questions (on Rite-in-Rain paper). The questions help guide them through their inquiry and are divided into groups: A) initial observations, B) measurement and detailed observations, and C) inferences and hypotheses. They dig a snow pit to the ground (typically < 2ft). Part A, they study the layered structure, the texture of different layers, the color (presence of sediment? ), initially using basic sketching. Then they decide what aspects are worth measuring in further detail (such as thickness of layers, hardness of layer, density of layers, size of crystals) and come up with a plan. Part B, they are allowed to begin making their measurements and they are given guiding questions, such as what are the errors in these measurements? How many measurements is sufficient to describe the characteristic you are describing? Part C is primarily brainstorming ideas and hypotheses among their group, and they can return inside if they choose. They are asked consider the role that snow plays on the landscape. How does the snow affect the ground underneath it? Would that role be different at the coldest part of winter than during the spring melt? Does snow affect the air above it? How might snow play a role in the large climate system? Oral Synthesis: after completing Part C, each group is given a different overarching question, they must use what they have learned and their ideas to give a 4-5 minute oral synthesis to the class. This activity is meant to give them new insights into a common geologic material and to recognize the linkages between the atmosphere above the ground and the geology and ecosystem below.